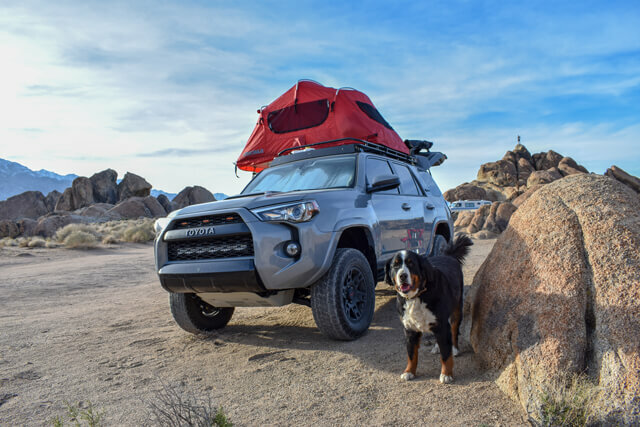 A guide to camping on BLM Public Lands at Alabama Hills - nestled in between the Inyo Mountains and the Sierra Nevadas off of California's Highway 395. A pet-friendly, scenic campground best visited in the spring and fall with activities such as hiking, casual mountain biking, off-roading, photography and more. Alabama Hills is located just a couple miles outside of Lone Pine, CA nestled in between the Inyo Mountains off of Highway 395 and the Sierra Nevadas. The Alabama Hills Recreational area is made up of a range of beautiful rock formations and hills and is managed by the Bureau of Land Management. At just over 5,000 feet of elevation, the recreational area faces Mt Whitney and provides stunning views of the Sierra Nevadas. 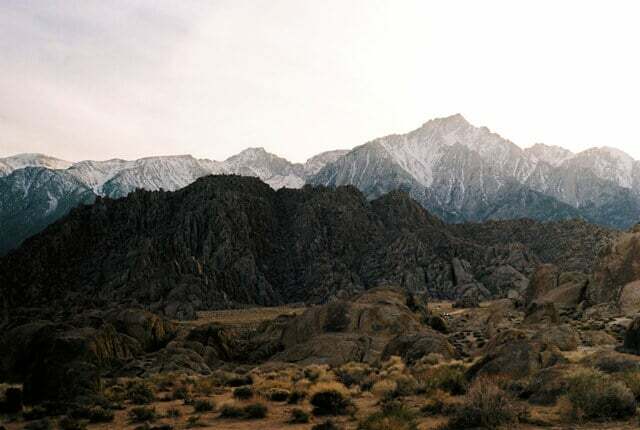 The area is well known for being a popular filming location for Western Films since the 1920’s, with scenes from Ironman and Transformers being filmed most recently at Alabama Hills. 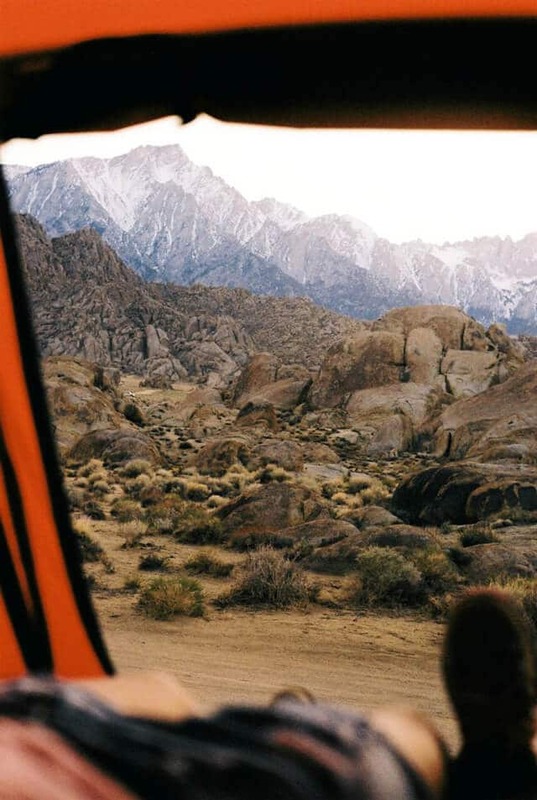 Alabama Hills is now a popular camping location due to the history and scenic views for days. Although you are not too far off from the main highway, you really feel like you are in a different world when camping at Alabama Hills. Take Highway 395 to Lone Pine, CA where you’ll be welcomed into the tiny, historic town with open arms. 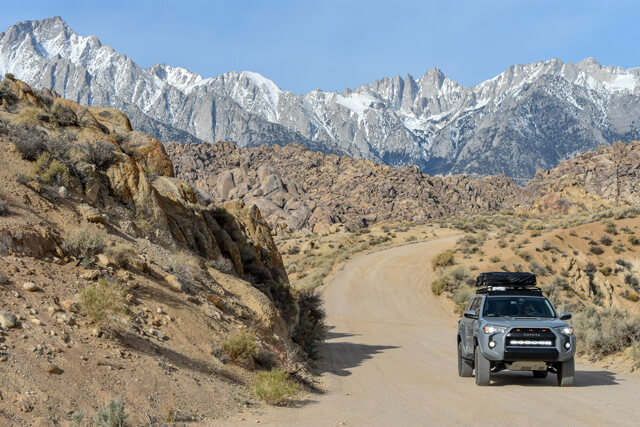 Turn West at the stop light for Whitney Portal Road, and drive about 2.5 miles into the Alabama Hills Recreation Area, then take a right at Movie Road. After that, you’re officially inside Alabama Hills. 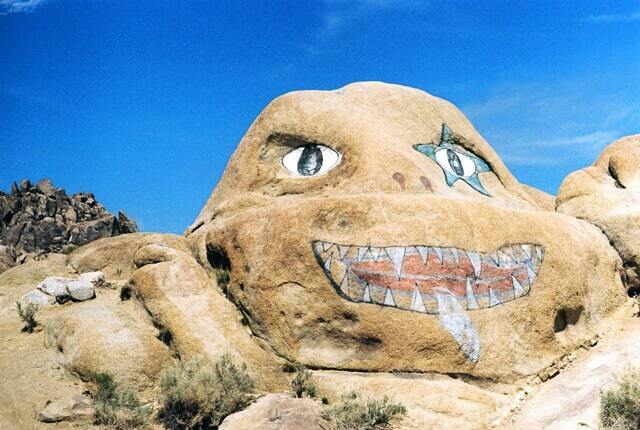 When you drive by the Alabama Hills Rock Monster, you’ll know you’re at the right place. Food in Lone Pine – If you’re hungry for breakfast or lunch, I recommend stopping by the Lone Pine Cafe for a tasty meal. For dinner, I recommend checking out the Lone Pine Smokehouse for some good BBQ. The great thing about camping at Alabama Hills is that it’s completely free! Since the area is managed by the BLM, it’s a public land that’s open and free for all to enjoy. Please note, there is a standard 14-day limit when camping at BLM or public lands. Once you begin driving on Movie Road, you’ll notice several roads that branch out into new areas. From here, you can drive and explore while taking in some of the beautiful scenery. On BLM land, you won’t find campsites that marked and labeled like you would at a traditional campground. You will, however, notice areas that are more developed and ready for you to set up your camp. I recommend looking for a find a spot that has some shade from the towering rock formations if you are lucky enough to find one. There are several camp spots at Alabama Hills that are completely exposed and can get very warm during the day. I recommend getting there early to have the first choice at the best spots. I arrived a little after 2 pm and noticed several RV’s and campsites already set up in some great looking spots. Camping on Public Lands is about the bare necessities. As this a public land and not a traditional campground, you will be giving up some of the amenities you may be used to at campgrounds, including showers, bathrooms, and water or power plugins. If you want to avoid going a few days without a shower, I recommend checking out the ShowerPouch as a way to stay fresh after spending time outdoors. For some tips on how to go to the bathroom while camping, check out our previous post here. Because it is the high desert, temperatures can get pretty warm during the day and also drop pretty low in the night. In the winter, temperatures can be below freezing at night, so be sure to bundle up and travel prepared if you plan to sleep in a tent. If you plan on starting a fire at Alabama Hills, you’ll need a campfire permit. The permit is free to obtain after you watch a short video and take a quick quiz. I recommend getting your permit and keeping a copy printed in your car or with your camping gear. 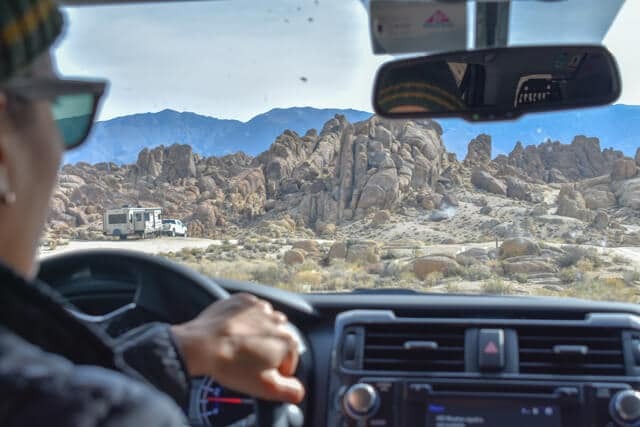 There are several types of activities you can do at the Alabama Hills Recreational Area – including off-roading, hiking, casual mountain biking, sightseeing, photography and rock climbing. There are beautiful arches and geological formations all over the Hills that are fun to explore on foot or on a bicycle. In the evenings, the sky is light up by the stars making for great star gazing. Try to visit on a weekend when there’s not a full moon if you’re really trying to enjoy the stars out there! 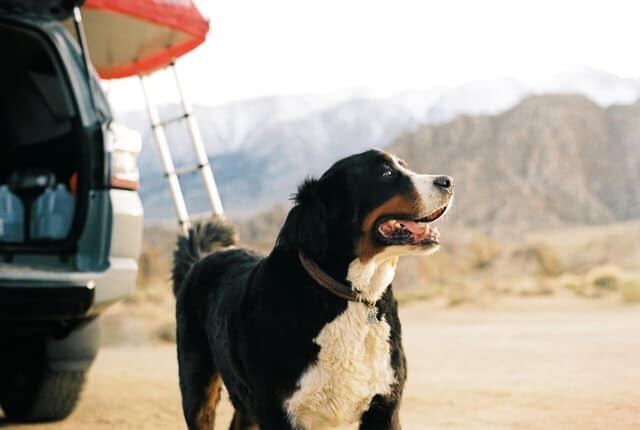 Alabama Hills is also pet-friendly, so feel free to bring your furry friend along! Be sure to look out for ticks and fleas in the area though since they are common in the area. I definitely recommend bringing bug spray and sunscreen to Alabama Hills. The sun can get strong during the day and with not much shade in the area, it’s easy to get burnt. In the spring, the bugs really start to come out, so be prepared for that as well. Since this is public lands, you’ll also need to bring your own chairs, tables and any other amenities you may need to camp comfortably. It can get dark at night so be sure to bring lanterns and lights as well. The MPOWERD | Luci Lux Light is a great option for a camp site lantern. The inflatable lantern is completely solar powered and does not require any batteries at all. Leave it on your dash during the day (7 hours is a full charge) and the Luci light can provide up to 12 hours of light on a single charge. Since the lights are collapsible they don’t take up too much space in your bag either. The Helinox Chair Two is hands down my favorite camping chair. The shock-corded pole construction lets you get set up in a matter of minutes. When not in use, the chair fits in a small bag and is easy to carry around. 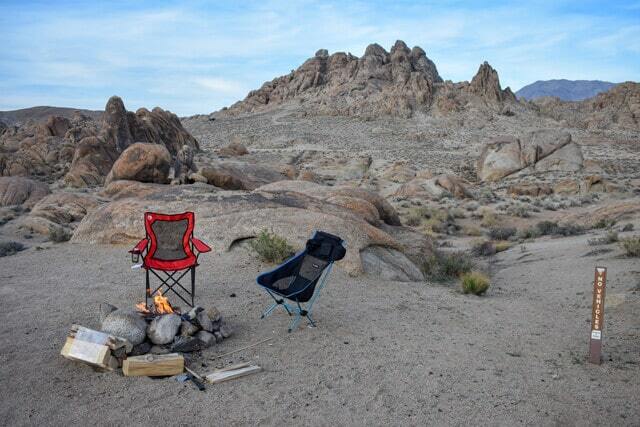 Set up the Helinox with the added rocking chair feet and you can sit and enjoy the Alabama Hills sky all night long. The JetBoil Flash Personal Cooking System makes cooking as easy and mess-free as possible. You can boil water in 90-seconds and cook up your favorite dehydrated meals in less than 10 minutes. This is extremely convenient when camping on public lands and helps you minimize the amount of waste you are making at your site. The Therma-A-Rest Vela 35 Degree Down Puffy Camping Quilt was a lifesaver during my trip to Alabama Hills. I visited in early Spring when the temperatures were still in the low 30’s at night. This down quilt helped radiate heat and comes in a Double or Large size so you can share with your tent-mate. Depending on how long you plan to be off the grid, it’s a good idea to bring a portable battery pack with you to help charge your devices in case of an emergency. With up to 8 full charges, the Mophie Power Pack XXL is a great option to keep you and your friends charged up.